Eurostat came out with the Q4 number for GDP and, unsurprisingly given the stream of contractionary-looking data out of Europe lately, it showed a moderate (0.3%) drop over the prior quarter. 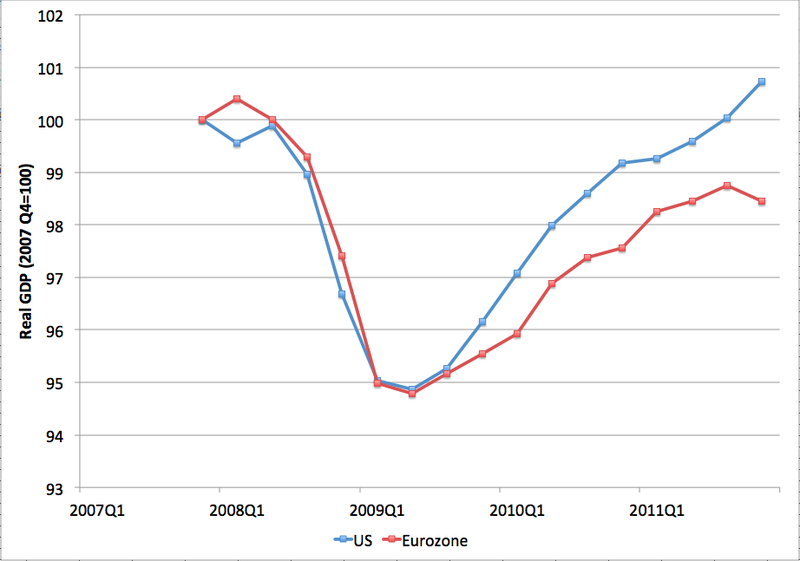 I wanted to contrast it to the rather stronger US data, so the above picture shows the level of real GDP for both economies with both normalized to set Q4 of 2007 to 100 (ie just before the great recession). 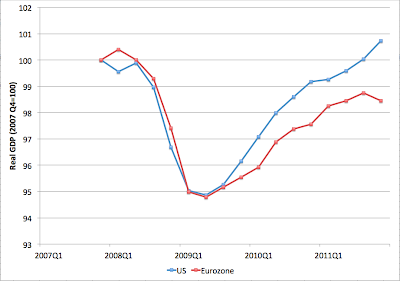 Data are from Eurostat and the BEA. You can see that both took about a 5% hit to output in the great recession, but that the US economy has since been recovering somewhat faster and is now clearly above the level of the pre-recession peak. Meanwhile, Europe appears to be experiencing a double-dip recession due to the unresolved sovereign debt issues there and the strongly contractionary fiscal policy being pursued, particularly in the periphery. Obviously, the future is eventually going to arrive and we are going to have to pay for the oil and toys we are not fully paying for at present. In short: enjoy it while it lasts! Euro exports 5.56% of Utah's GDP? That's weird. 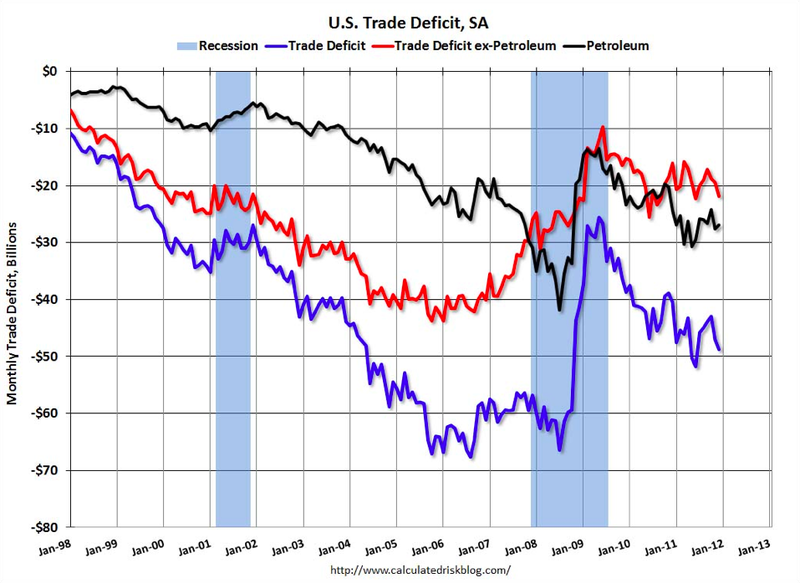 It's also interesting how our deficit with China gets all the press and noise, but our oil import deficit, not so much. More than half of Utah's exports are gold. 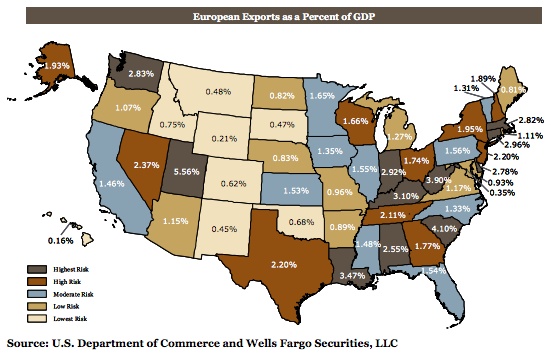 Given that gold is in high demand in part because of the euro crisis, the crisis may actually be a boon to Utah! 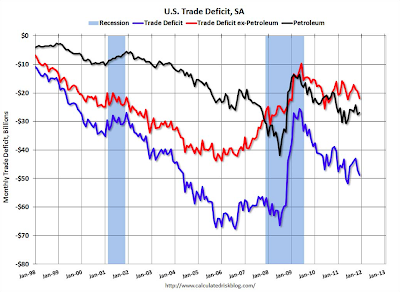 While you are right to point out that oil makes up a large share of the trade deficit, this is actually set to improve sharply over the coming few years. The U.S. imports about 9.0 mm bbl/day of crude oil, and is actually now a net exporter of refined products. Of that 9.0 mm bbl/day, 2.5 mm comes from Canada, a number set to increase by perhaps 50% (assuming the Keystone XL pipeline is built). U.S. production is also set to rise sharply as shale oil produces a boom that will surprise the even the "Drill, baby, drill" crowd. All told, the oil deficit could easily fall by close to half by 2020. 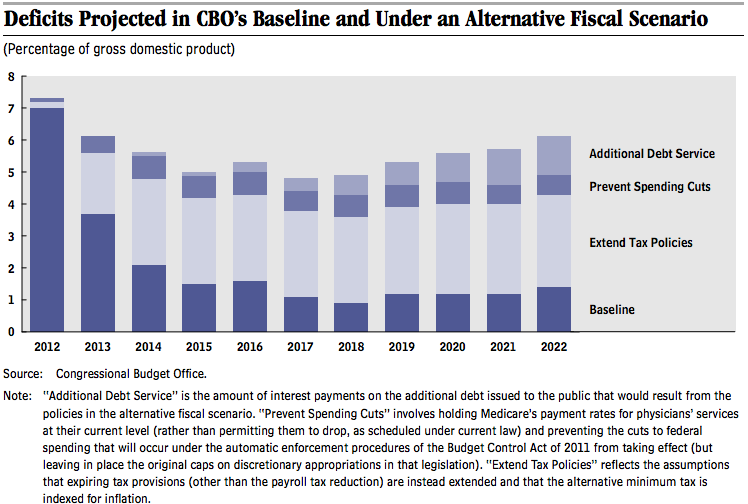 Running a massive deficit could also be interpreted as a massive stimulus. If a bunch of foreigners (ie suckers) want to exchange huge amounts of real assets for paper dollars at below inflation interest rates, even better. 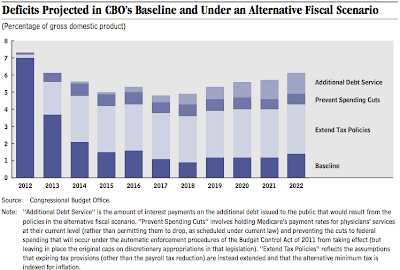 It's pretty clear from the chart whether austerity or stimulus is a better approach. It's even more amazing considering that this crisis actually originated in the US, so you'd expect that the damage would have been worse there.